Cast-concrete or cast resin vessel, water, artist’s body, video projection, sound. From Greek “concept” and “thought in mind”, Ennoia was inspired by my reading of Gnostic texts. It is the edge of light that collapsed into this world, into flesh. Curled-up inside the vessel’s interior shape I lie almost motionless. The vessel is shaped like an octagonal chalice, reminiscent of a medieval baptismal font and filled with water. During the several-hour performance, I move slowly along the inner walls of the vessel. From time to time I emerge from and submerge into the water. Sounds of the immersion are picked up by underwater microphones installed in the basin. I repeat the performance on several different days during the time of the installation. Suspended perpendicularly to the basin from the ceiling a video camera films my figure immersed in water. This “bird’s eye” view is projected onto the wall just beyond the basin, translating the view from above to a flat, painterly representation. A reflection of that projection can be noticed on the surface of water. At times I look directly at the camera’s lens, and the viewer may see my gaze in the projected image. The image itself is composed of live and pre-recorded forage, creating a visual tension between the presence of my body and the virtual depiction of an earlier act of immersion. As I remain in the water-filled vessel, the uninterrupted video projection (the image of my immersed body) appears more real than my live body. Through the long-term immersion –the symbolic transgressing of the boundaries of body – Ennoia creates a site of undefined ritual, in which the viewer can symbolically immerse herself or himself. At the same time the boundaries between the action/sculpture and the viewer are impenetrable. The relationship of body and vessel, which contains both body and water, seems hermetic. I remain silent, almost absent despite enormous focus. My body is naked, anonymous, in a semi-permanent state of duration, deprived of attributes, as if generic. 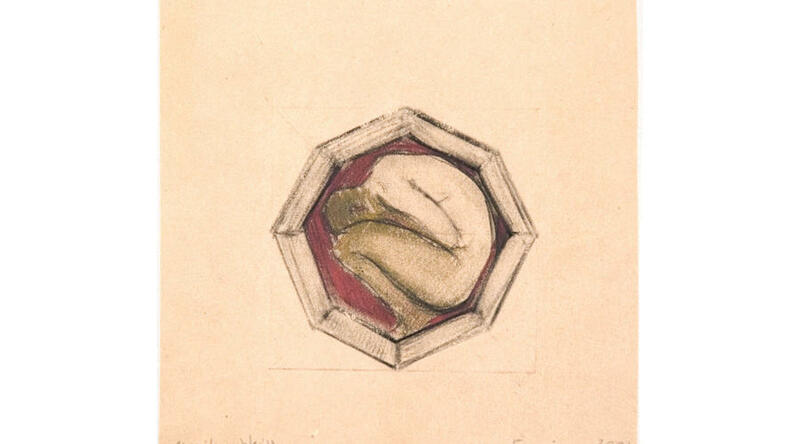 It is a body of an adult woman yet curled up in a position calling to mind the non-gendered vulnerability of a child. 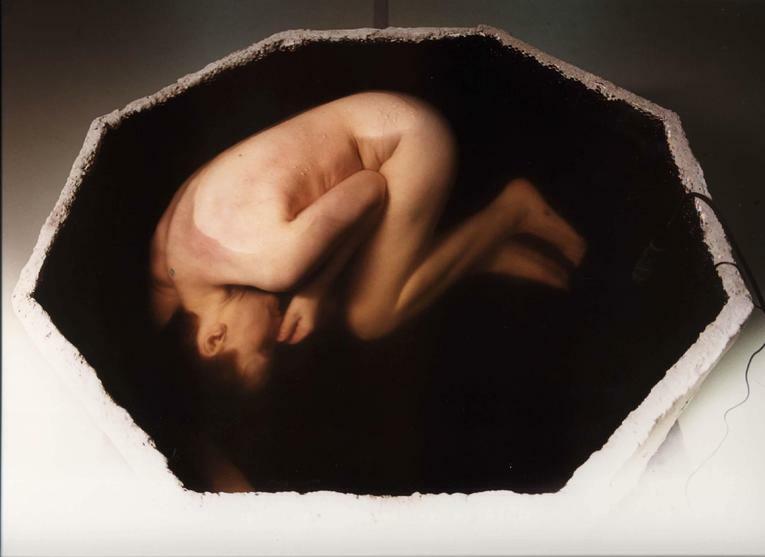 In 1996 I encountered an octagonal medieval baptismal font in a Polish church in Wrocław, which inspired a series of sculptures, installations, and performances. 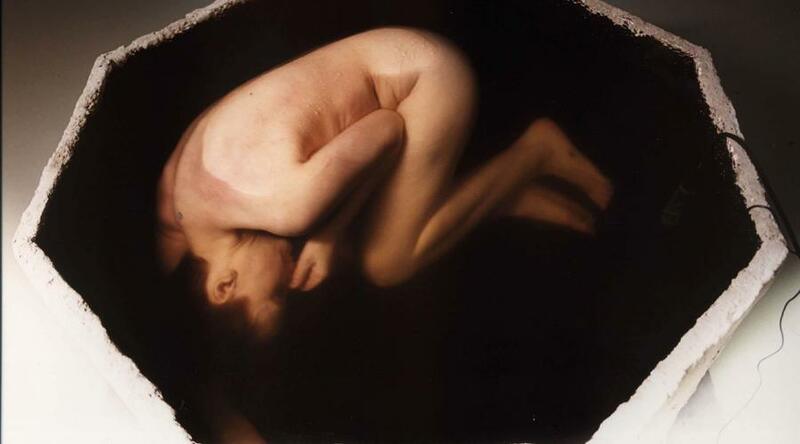 Koiman (1998) included a baptismal from cast-concrete, overflowing continuously with eighty gallons of recycled, used motor oil, creating a river of oil on the floor that reflected a video projection on its surface. In 2001 I began a series of performative installations that included a similarly sculpted font with water and my own body. This text was published in 2004 in “Monika Weiss Vessels” by Chelsea Art Museum, New York with the support of Polish Cultural Institute New York, Diapason Gallery, and Experimental Intermedia, New York. Paperback, 32 pages, ISBN 0-9713597-4-1.